The templates menu in the text editor contains a few more templates now. For faster access you can also use the Ctrl Spacebar shortcut. Some templates have some extra settings you will be asked for. 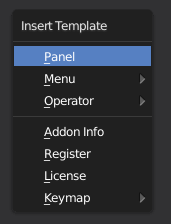 For example the name of a new Panel.